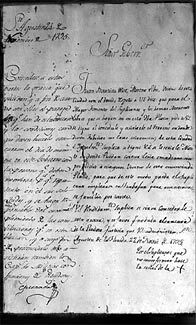 Prince Witten's 1795 petition seeking freedom under Spanish law for himself and his family as refugees from slavery. Florida State Archives. Spain officially regained Florida in 1783. The empire, however, was now so weak that it could barely exert any influence over the colony. Fugitive slaves from Georgia and South Carolina continued to escape to the region, but they increasingly sought ties to the Seminoles, not the Spanish. The shift is reflected in the life of Prince Witten. A fugitive slave from Georgia, Witten successfully applied for Spanish citizenship in 1795. By 1812 he was a friend of the Seminoles, prominently fighting alongside them against the United States.